» GOOD COP, BAD COP: Freeman Wills Crofts & Ian Rankin, by Curt J. Evans. GOOD COP, BAD COP: Freeman Wills Crofts & Ian Rankin, by Curt J. Evans. In his Rough Guide to Crime Fiction (2007) [reviewed here ] Barry Forshaw has a chapter, “Cops,” with 31 novel entries. Merely two of the novels listed were published before the 1980s: Ed McBain’s The Empty Hours (1962) and Georges Simenon’s The Madman of Bergerac (1932). Ian Rankin, creator of Inspector John Rebus and currently the most popular crime fiction author in Britain, gets one entry, for The Falls (2001), as well as a page devoted to his works in general. Freeman Wills Crofts, creator of Inspector French, the greatest police detective of the Golden Age of detective fiction (roughly 1920-1940), gets no mention in the “Cops” chapter, nor anywhere else in Forshaw’s Guide for that matter. This omission is an injustice to Freeman Wills Crofts. No doubt this author is out of fashion these days, but in his own way he is as important to the history of the crime fiction genre as Ian Rankin is. To be sure, Ian Rankin, the leading figure in the so-called “Tartan Noir” movement, has been a powerful force in moving British detective fiction away from its cozy, genteel, village and country house gentry stereotype, but in his own day Crofts did much the same thing, albeit more gently. 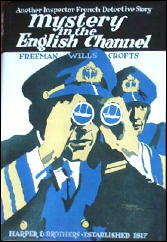 While Crofts’ most famous creation, Inspector French, is a much more conventionally “nice” individual than Rankin’s John Rebus, Crofts’ tales of French’s criminal investigations give readers a different picture of the Golden Age British detective novel than that which has been derived from the better-known works of the British Crime Queens (Agatha Christie, Dorothy L. Sayers, Margery Allingham and Ngaio Marsh). By exploring Freeman Wills Crofts’ Mystery in the Channel (1931) and Ian Rankin’s Hide and Seek (1990), I want to highlight not only the differences between Crofts and Rankin and their fictional detectives, but — which may be surprising to many — the similarities. Crofts created Inspector Joseph French as a series character (he appeared in a long series of novels published between 1924 and 1957, the year of Crofts’ death) in order to get away from the eccentric amateur detective figure so strongly associated with British mystery. French won immediate popularity around the globe, becoming one of the best-known fictional crime investigators of the British Golden Age. A plain, no-nonsense, middle class cop, Inspector French stands in stark contrast with such glamorous aristocratic sleuths as Sayers’ Lord Peter Wimsey, Allingham’s Albert Campion and Marsh’s Roderick Alleyn (though Alleyn himself is a cop, he is rather a twee one), as well as Christie’s eccentric Belgian, Hercule Poirot, and her nosy village spinster, Miss Jane Marple. In 1936, Crofts’ American publisher, Dodd, Mead, informed potential Crofts readers that the author had deliberately built up Inspector French “as a foil to the theatrical and eccentric fictional sleuth” and that the police detective therefore was “a model of thoroughness, persistence and hardwork” — an ideal embodiment of the bourgeois virtues. 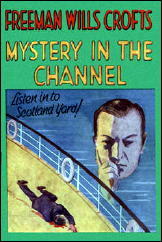 Mystery in the Channel, the seventh Inspector French novel, shows both the detective and the author at the height of their powers, in a typical case involving not misdoings in a baronial mansion or a quaint Edwardian village, but modern corporate corruption and crime involving two countries. Could these deaths be related to the rumors in the City that Moxon’s was headed for a complete crash? It certainly seems so, when it is discovered that a million and a half pounds has been looted from the firm’s coffers. Scotland Yard’s investigation involves delving into matters both financial and logistical. What were the two murdered businessmen doing on the yacht and who could have gotten on the yacht to murder them? To some this may sound dry, but Crofts manages to keep the reader in doubt and suspense until a dramatic climax is reached, when the dauntless French nabs the guilty. ● Sir Mortimer Ellison, Assistant Commissioner of Scotland Yard, French’s boss throughout the series. ● Police Sergeant Carter, French’s chief underling throughout much of the series. French also has to deal with local law enforcement officials in both England and France. Admittedly, Crofts’ treatment of the police often is naïve, but his books certainly mark a departure from the Golden Age stereotype of amateur detective and country houses/villages. How does Crofts compare with Rankin, a hugely popular author widely deemed the modern master of the British police procedural? 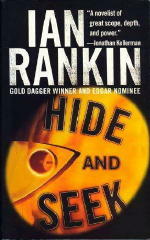 Hide and Seek, the second Ian Rankin novel about Inspector John Rebus, appeared in 1990. In this tale, Rebus investigates the death of a young male drug addict found expired, surrounded by Satanic symbols, in a squalid Edinburgh “squat” (abandoned building). Everyone but Rebus writes the death off as an accidental overdose, but the tenacious and stubborn detective eventually discovers darker truths, namely that the young man was murdered and that a malign conspiracy involving very prominent people is afoot in Edinburgh. Contrastingly, in Hide and Seek we learn that John Rebus’s wife has left him and his household behind, taking their daughter, Samantha (Sammy), with her. Rebus leads a much lonelier, angst-filled existence than French, and he has no one to tidily arrange his domestic life. Instead, he goes through a series of girlfriends, drinks too much and smokes too much — all patterns of behavior alien to the the abstemious and upright Joseph French. (It is rather shocking when a frustrated French at one point in Mystery in the Channel declares, “Curse it…I could do with a bottle of beer.”) Like French, Rebus seems to have some religious inclinations, but, unlike French, Rebus is unable to sustain them. Nevertheless, French as well as Rebus sometimes bucks the system. 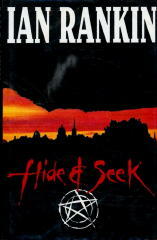 In Hide and Seek, Rebus finally exposes the criminals by a not-by-the-book stratagem that is like something Bulldog Drummond and his jolly amateur crime fighting pals might have tried in an outrageous Sapper thriller from the 1920s. For his part, French for the sake of expediency on occasion employs skeleton keys to conduct warrantless searches and sometimes “bluffs” recalcitrant witnesses (misleadingly threatens them with arrest) to get the information he wants. Not surprisingly, given the tenor of modern times, Rebus’s cases tend to involve much racier subject matters — bad stuff — than those of Inspector French. In Hide and Seek, for example, Rebus confronts a case involving such unsettling matters as Satanism, drug abuse and (male) prostitution. Certainly no such things crop up in Crofts’ Mystery in the Channel! By making such an assertion, Symons reveals he did not sufficiently comprehend the work of Freeman Wills Crofts. When writing Mystery in the Channel Crofts clearly was influenced by the deplorable state of the world since 1929, after the Wall Street Crash and the onset of the Great Depression (events that also have resonance today). But John Rebus, like Joseph French, proves sterling and incorruptible. In the end, Rebus and French share this defining quality with each other and, indeed, with Wimsey, Campion, Alleyn, Poirot, Marple and the rest of the crime and mystery genre’s Great Detectives: a determination to find answers, to establish truth, to restore some semblance of order in a world of chaos and confusion. Crofts I’ve read, but I admit that it was well over 50 years ago when I did. I remember the puzzle aspect vividly, but no details other than that. I was attracted to the Rebus novels at first because of the character’s last name, thinking it meant that he, like Inspector French, also solved detective puzzles. I bought a few of the Rebus books, but I’ve never read any. Reading reviews of them, I gathered that there’s little “puzzle” aspect involved. Am I correct in thinking that, or are they mostly downbeat crime stories, as I’ve been assuming? Not that there’s anything wrong with downbeat crime stories! Your assumption is very much correct, Steve. Steve, the most recent Rebus I’ve read is The Falls and it’s actually quite a bit like Ruth Rendell in terms of having a lot of plot. Although in the end it’s not nearly as clever as a Ruth Rendell. But it kept me interested enough for its 500 pages. Probably Rankin is best at detailing the lives of a large cast of police characters. Among more recent British procedural writers a better plotter I think is Stephen Booth.